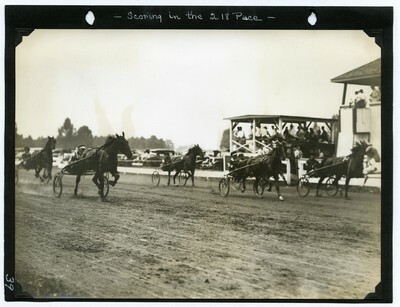 Black and white finish line photo of a heat of the 2.18 Pace on July 4, 1931 at the Bay State Circuit, Sage Park, Windsor, Connecticut. Horses in the contest included Miss Volo, who finished first in all three heats; Czar Mobel; Dora Signal; F.M.B. ; Bud Azoff; New Model; and Queen Alice.